draft and edit a short story that draws on research of a children’s radio program. Reading Standard: students view imaginative, informative and persuasive texts that explore ideas and information related to challenging topics, themes and issues. They identify the ideas, themes and issues explored in these texts, and provide supporting evidence to justify their interpretations. They produce personal responses. They infer meanings and messages in texts. Writing Standard: students produce, in print and electronic forms, texts for a variety of purposes including speculating, hypothesising, persuading and reflecting. They write extended narratives or scripts with attention to characterisation, consistency of viewpoint and development of a resolution. They edit their writing for clarity, coherence and consistency of style. Speaking and Listening Standard: students express creative and analytical responses to texts, themes and issues. They critically evaluate the spoken language of others and select, prepare and present spoken texts for specific audiences and purposes. When listening to others, students ask clarifying questions and build on the ideas of others. The activities in this unit are relevant to the Interdisciplinary Learning strands of Level 5 Communications (Listening, Viewing and Responding standard; Presenting Standard), and Thinking Processes (Reasoning, Processing and Inquiry standard; Creativity standard). The activities are also relevant to the Physical, Personal and Social Learning strand of Level 5 Interpersonal Development (Building Social Relationships standard; Working in Teams standard), and Personal Learning (The Individual Learner standard; Managing Personal Learning standard). Are there any Australian programs for children on the radio today, or presented in radio format (as in podcasting) on the Internet? If so, describe them. If not, offer reasons. In pairs research the history of Australian radio serials for children from the 1930s to the 1950s, then present an illustrated article of about 400 words about the topic, aimed at a popular magazine for children and young teenagers. Make sure the magazine pages you produce have either two or three columns, and all headlines, text and picture captions are word-processed. 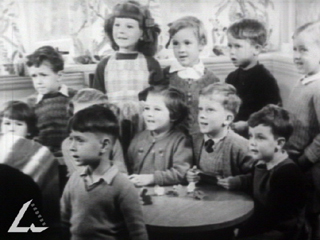 After watching the video clips of This is the ABC and The Invisible Link, plan, draft, edit, proofread and correct a short story in 500 words about a home or school in the Australian outback where young children are about to listen to a radio broadcast of the Kindergarten of the Air. What happens, who are the characters, when and where is the story set? The story may be a drama or a comedy, and should be set many decades ago, before TV was introduced in Australia. (You may need to carry out further research on the history of this radio program before writing the story).